The Simms Vertical Mesh Fly-Fishing Vest is a great fly-fishing offered at a great, economical price. This fly-fishing mesh vest has all the great features that you’d expect from a Simms fly-fishing vest that include 19 pockets which include 2 large bellowed vertical pockets with moveable divider and top/side access, 2 side entry chest leader pockets, 1 medium bellowed chest pocket, 2 small upper chest pockets, 2 small lower side pockets, 4 interior pockets, 2 interior large horizontal zippered pockets, 2 large interior vertical zippered pockets, 1 zippered back pocket, and 1 side-open back cargo pocket. This fly-fishing vest is made with 100 percent Nylon riptstop fabric with a water resistant finish and a 100 percent Polyester mesh lining. This fly-fishing vest is designed with lightweight breathable shoulders as well as 2 patented built-in retractor clips and a padded rib knit collar are included with this Simms fly-fishing vest. This Simms Vertical Mesh Fly-Fishing Vest is a lightweight vest weighing in at just 17 ounces. 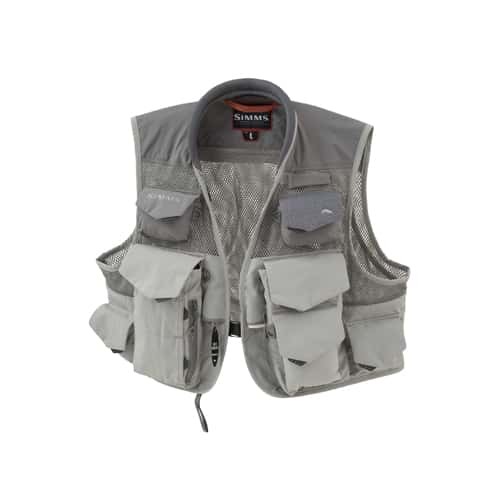 All of these great features makes this Simms fly-fishing vest one of the best on the market today and is becoming very popular among most fly-fisherman worldwide. 19 pockets: 2 large bellowed vertical pockets with moveable divider and top/side access, 2 side entry chest leader pockets, 1 medium bellowed chest pocket, 2 small upper chest pockets, 2 small lower side pockets, 4 interior pockets, 2 interior large horizontal zippered pockets, 2 large interior vertical zippered pockets, 1 zippered back pocket, and 1 side-open back cargo pocket.